On July 25, 1609, the excellently named British ship, Sea Venture, encountered serious storms while crossing the Atlantic Ocean en route to Virginia, and was purposely run ashore to prevent loss of the ship and passengers. These would be colonists of the Virginia Colony instead found themselves on the uninhabited Island of Bermuda, establishing a European presence that continues to this day. About 665 miles East-Southeast of North Carolina, Bermuda is in the Atlantic Ocean, unlike the other European settled islands in the New World, most of which are either adjacent to North or South America or in the Caribbean Sea. First encountered by a Spaniard named Bermudez, the island derived its name from that sailor that charted it and its related archipelago, although he never landed on the island. The first Europeans to have landed on Bermuda were probably shipwrecked Portuguese sailors that left inscriptions on rocks. The Sea Venture accidentally landing about 150 English people in 1609 marked the beginning of the Bermuda colony which even today is still a British Overseas Territory. It is unknown how many of the number of people aboard comprised the crew. Sailing ships had been known to stop at Bermuda, with no attempt at permanent settlement. The coat of arms of Bermuda features a representation of the Sea Venture wreck. The Sea Venture was purpose built to carry colonists from Europe to the New World, specifically to Virginia as it was built by order of the Virginia Company, the company attempting to colonize Virginia at Roanoke and Jamestown. In fact, Sea Venture was the first ship ever built specifically for the mission of carrying colonists. She was of 300 tons and of single deck construction, meaning her cannons were on the main deck instead of on a dedicated gun deck below which would have compromised the ship’s passenger carrying capacity. Launched in 1609, it is believed that the ill-fated voyage that brought the ship to Bermuda was its maiden voyage and its last. She was armed with 8 X 9 pounder guns, 8 X 5 pounder guns, and 4 X 3 pounder guns (called Falcons), as well as having 4 arquebus-type muskets. Unfortunately for the colonists at Jamestown, Virginia, the Sea Venture was the largest ship in a fleet of 7 vessels intended to resupply the starving colony with fresh people, equipment, and food. The failure of Sea Venture to arrive with much needed people and supplies almost cost the lives of everyone at Jamestown. Although the colonists at Jamestown were having their problems, the problems aboard Sea Venture were just as pressing. The newness of the timbers used in the construction of the ship meant the insufficiently seasoned wood allowed water to seep through the caulking between timbers. As the bad weather worsened, the water in the ship’s hold rose steadily despite all hands being applied to pumping and bailing. Despite throwing many of their cannons overboard, the ship continued to take on water, leading to the decision to run her aground to avoid losing the ship and all hands. The stalwart shipwrecked crew and passengers of the Sea Venture dismantled their wrecked ship and using local timber, constructed 2 new small vessels, equipping the new boats (Pinnaces) with the rigging from Sea Venture. The longboat from Sea Venture had survived and was fitted for a sail. This boat was sent to find Virginia but was never seen again after it departed Bermuda. The remainder of the Sea Venture’s passengers (142 souls), minus 2 criminals that had stayed back, hidden in the forest of Bermuda, left the island on the 2 little ships and sailed for Jamestown. On arrival at Jamestown, the Sea Venture people found only about 60 surviving colonists of the 500+ that had come to Jamestown! These beleaguered would be colonists were anxious to sail back to England, and with the 2 pinnaces made from the Sea Venture and a third vessel called The Virginia that had been constructed at the Popham Colony in what is now Maine a year or 2 earlier. These 3 small vessels carrying the old and new colonists left Jamestown but ran into a rescue and resupply mission before reaching open seas and returned to the Jamestown Colony. The wreck of the Sea Venture was found in 1958. Some people believe the saga of the Sea Venture was the inspiration for the Shakespeare play, The Tempest. The shipwrecked people from the Sea Venture had been marooned on Bermuda for 9 or 10 months before leaving on their little ships, claiming sovereignty of the island for England. An interesting historical note is that John Rolfe was among those shipwrecked people, losing his wife and child to illness while on Bermuda. Those 2 unfortunates are buried on the island, and Rolfe went on to Jamestown where he became famous as the European husband of the Native American Princess, Pocahontas. By 1612, the English began the permanent settlement of Bermuda that remains British to this day. Located in the Gulf Stream, Bermuda has a sub-tropical climate, never experiencing snow or frost as far as records indicate. Bermuda is a relatively small island, boasting an area of only 20.5 square miles and a population of only 64,000+ people. 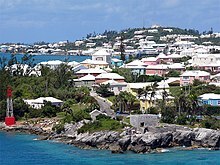 The demographics of Bermuda include a 54% Black (African descent) majority, with White European people making up 31% of the population as the largest racial minority. Among the White population, about 11% claim English heritage while 10% are of Portuguese descent. Although the main language of Bermuda is English, it is a variety of English heavily influenced by other (mostly African) languages. The real estate brokers in Bermuda claim the average house in Bermuda now costs almost $2 million apiece! Luckily for Bermudans, the GDP of Bermuda is about $100,000 per person, making it the highest per capita GDP in the entire world. As a territory with no corporate income tax, Bermuda is one of the infamous off-shore tax havens we read and hear so much about. Internet giant Google is said to have stashed over $10 billion in Bermuda to avoid US taxes. A sweet variety of onion, called appropriately, Bermuda Onion, had been brought to Bermuda from the Canary Islands and Bermuda became famous for these delicious bulbs. The island of Bermuda became so closely associated with their onions, that the people of Bermuda are sometimes referred to as “Onions!” Perhaps you have also heard of “Bermuda Shorts,” a semi-dressy type of short pants for men and women that may or may not bear a cuff and are cut to about an inch above the knee. These famous short pants have an origin with the British military. Supposedly the shortage of cloth on Bermuda during World War II resulted in the widespread use of short pants as a method to save cloth, spawning a fashion craze. The main forms of employment on Bermuda are with the government or dealing with tourism. An IOD racer on a mooring in Hamilton Harbour. Do you have any desire to visit this balmy island? Have you ever been there? If you have been there or know someone who has visited the island, let us know what you thought of the place. Doherty, Kieran. Sea Venture: Shipwreck, Survival, and the Salvation of Jamestown. St. Martin’s Griffin, 2008. Jones, Rosemary. Moon Bermuda (Travel Guide). Moon Travel, 2018. Karwoski, Gail. Miracle: The True Story of the Wreck of the Sea Venture. Darby Creek Pub, 2004. Previous ArticleJuly 17, 1918: Whatever Happened to the Ship That Saved the Titanic Survivors?